In my review of the first of the Books of Babel series, Senlin Ascends (see here), I described Josiah Bancroft’s debut as “An engrossing, intoxicating delight – I can’t wait to climb higher.” )in fact you can see that quote on the back cover of the new book!) So you can imagine that I have been eager to read the second book and see if it lived up to the promise of that compelling debut. Well, the short version of this review is yes, it does, and then some. Thomas Senlin, our errant fish out of water headmaster is still determined to locate his missing wife, but now it seems as if he is further away from that goal, both physically and emotionally. He is now going by the name Tom Mudd, captain of a piratical airship, with his small, motley crew, and as far as actual piracy goes, they tend to be rather gentlemanly, as poor Tom is reluctant to surrender all of his remaining principles, already eroded enough by his misadventures in the first book. But circumstances are becoming increasingly dire – months have passed, our little crew is glad to be free, each from their previous form of entrapment, and they seem to be forming a genuine bond together. But as desperation presses them they find they are going to have to take bigger chances, returning in their stolen airship to the Tower of Babel, this time to levels we’ve not yet encountered, and it goes without saying that if the lower ringdoms of the Tower have a habit of enmeshing unwary visitor, these new levels are even more dangerous, their inhabitants even more devious and with much more opaque motivations. So far we’ve heard whispers of secretive (or possibly whatever the Tower equivalent to urban legend is) figures, powers behind the scenes (if they exist, many think they are just legend), Luc Marat, the Hod King (the Hods being those unfortunates enslaved and who do much of the work that maintains the Tower life), and the even more mysterious Sphinx. Tom’s first mate on the airship, Edith, confirms reluctantly that the Sphinx is indeed real – her marvelous mechanical arm which replaced her damaged fleshly appendage, is a construction of the Sphinx, powered by the same red fluid batteries Tom has seen before in the vicious Red Hand in an earlier level. It seems the Sphinx has fingers in many pies throughout the levels of the Tower, and makes contracts with some he selects, such as Edith, with certain services required further down the line. But what game are these two shadowy figures playing? They seem to extol certain ideas but clearly also have other agendas, some of which may be contrary to their more openly espoused aims. Which are the real goals, how will Tom and his crew fit into their plans and will they survive them? 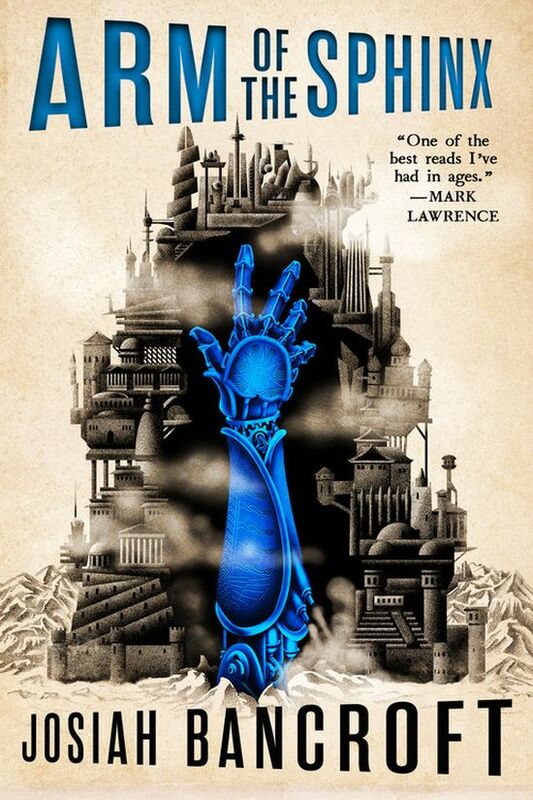 This is an immensely satisfying sequel to Senlin Ascends, and the book is full of multiple possible meanings, right from the title itself – the Arm of the Sphinx could literally refer to the mechanical arm he replaced Edith’s missing limb with (leaving her in his debt), or it could refer to his reach, connecting to all the various ringdoms of the Tower. And it comes as no surprise that a being named after the mythical riddler is something of an enigma – we don’t even know if this is the same Sphinx as the legends. If it is then he is far older than any human being could possibly be, or is there something more to the person, or the legend? And if so what, and why? Marat too, sitting in the ruined level of the former Golden Zoo (an eerie location if ever there was one, it has that creepiness of a funfair after it has closed for the night) seems to be more welcoming and genial, more humanitarian in his mission than the Sphinx, but like many who seem to be selfless and committed to a noble cause rather than their own aims, he may well be the opposite of what he appears to be. This quality of the book extends to our small crew as well – Bancroft takes great pains to show us the many failings and weaknesses of each of the crew, but he balances this out by showing their better characteristics, not least their increasing bond to one another, a growing, genuine affection. They’re becoming a family, and like every family there is bickering, there are mannerisms and habits that drive others mad or to despair, and yet through all of that their fondness and loyalty to one another wins over, and it’s rather endearing. It all combines to give us far more three dimensional characters, flaws and all, and makes them both more believable and more relatable – I’ve become very attached to Tom, Edith, Erin, Voletta and Adam, and that emotional attachment, of course, draws me further into their story. I praised Bancroft’s use of language in the first book – I was not surprised to learn that he was a poet before he turned to prose, as many of his lines and paragraphs have a beautifully worked, lyrical flow to them; this is a writer who really knows their wordcraft. And again the descriptions are remarkable, rich and evocative – think an SF&F version of Raymond Chandler on the descriptive phrases front, with lines like “the marble statues with robes no thicker than spilled milk”. It’s a wonderfully rich reading experience, the character developments, the twisting narrative twining its way up the Tower like writhing snakes, the labyrinthine, possible Machiavellian motivations of the hidden power plays of Marat and the Sphinx, some deliciously slow reveals about the history of the Tower (even this monumental structure may not be what it seems, continuing the theme of hidden or double meanings). The middle books of a series often suffer by comparison to the beginning and end volumes, but here there is no such problem, Bancroft’s writing is too skillful. In fact this serves to draw you ever deeper into the mysteries of the Tower, the lives and trials of our main characters and narrative, leaving the reader eager for the third volume, The Hod King. Senlin Ascends made my annual Best of the Year list, and Arm of the Sphinx will doubtless make this year’s list, which is as strong a recommendation as I can make. You can read an excerpt from Arm of the Sphinx on the Orbit blog here. This entry was posted in books, reviews, Science Fiction and Fantasy and tagged Arm of the Sphinx, books, Josiah Bancroft, Orbit Books, review, reviews, science fiction, The Books of Babel by Joe. Bookmark the permalink.